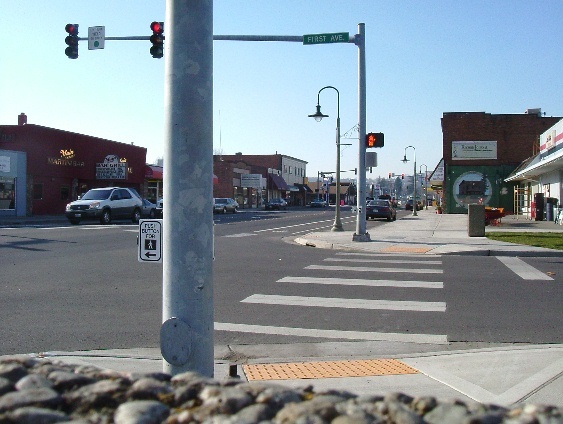 Editorials from Theslowlane: Main Street improvements, Ferndale, WA. Main Street improvements, Ferndale, WA. Main Street Ferndale, Washington. Doesn't look bad on a Saturday (when I biked there), but choked with traffic weekdays according to a February 26 Herald article. Things usually look better from a bicyclist's perspective anyway. Car and business owners are doing some fuming now that the 5.4 million dollar bridge and street improvements are complete. It's still just 2 lanes. To widen this section of Main into 4 lanes would likely require tearing down the businesses who's buildings abut the right of way. Tear down Main Street businesses to make room for more cars, or try and survive with less cars. Bus service is gradually improving. The sidewalk and bike lane improvements, that were part of the recent work, take up less space than making everything 4 lanes, 6 lanes? 8 lanes? March 5 Bellingham Herald had letter to editor from someone complaining that the city built bike lanes along Main St. when it didn't fund connecting Thornton Road to I-5 to help the cars. I had to look up where Thornton Road is on Mapquest. Wonder if that would have been much more expensive or how they could have connected to the freeway? Portal Way Exit?